Stay off your feet as much as you can today Daisy. I'm excited for you for tomorrow. Soak it all in and enjoy. I didn't think that fancy dress was very popular in European marathons chicksta or is that a bit of a myth? Sorry to hear you are still coughing, nothing to prove at the minute so rest and recover. Hope you are feeling better Wabo. Yesterday's lyrics - Here Comes The Weekend - The Jam. Thanks LMH....planning very little today. Just a short walk to the shop as my boys have demolished the contents of the fruit bowl. Lmh so sorry to hear your frustrations. Chick I'm excited if you do 2 oceans. Have you decided for sure? Take it Caerphilly, Emz! And Daisy! It'as cold out there! Just warming up after Grace's walk before wrapping up and heading out for my run. Cheese festival sounds good emzap - where is it? Great that your boys enjoy their fruit Daisy. What: parkrun, slightly harder than usual without being flat out. Around 23:40, so my best on that course. Why: felt better today! First time since February 13th! Just hoping it stays that way! And yes it was cold LMH! Two tops plus gloves but did wear shorts. Edit: official time 23:32. Found the hills tough today. Need to work on that! Fastest run for course so a PB and hilly so very pleased.Looking forward to next Saturday. So I walked the whole course and we did it in 45 something. I can tell you that Powerwalking at that speed hurt my legs more than running at that speed! Cheese festival is at Malvern county showground so I'm expecting it to be big. That's a good time ale, you're heading in the right direction. How are you feeling poppy? A shame emzap - if it had been closer to us I'd have seen if mark would go - enjoy. Great that you are feeling better now Alehouse. That sounds like a good run Poppy, nice when that happens. Must be something in the air as I had a better run this morning too - and most welcome it was. Probably back to where I was at the beginning of Feb: ran 23:00 and 22:54 in Jan and Feb on easier courses. OH: when they were doing the "parkrun tourist" bit this morning they announced someone from Orkney! No idea who, unfortunately! LMH: Berlin ist very different to other European cities I overtook plenty of runners in fancy dress and was blown away by the spectators' reaction. Glad you had a good run. Thinking of either Pippi Longstocking or a hula outfit (grass skirt and flowers). Both should be relatively easy to run in. How are the nerves, Daisy? Good parkrun, ale. It was snowing here, so I gave it a miss. I also overslept a bit. Enjoy the cheese festival, em. Yep, my mind is set on Two Oceans and holiday in ZA. Emzap I can imagine that about power walking! Alehouse happy for you as well! Got to go just got text my daughter's buggy has been taken, bu**er it!!! Great runs folks. I have had a walk out and went over to the park to watch my friend's children do the mini mile. We all got soaked! But great atmosphere Now under a blanket watching crap TV. Strangely enough I was only listening to an item on the radio about buggies being stolen the other day Wabo, maybe even yesterday, I hope that's not the case with your daughter's. You'll be fine once the gun goes Daisy but try not to use up too much energy worrying about things you can't change before then. Do you have your kit, number, pre and post race food sorted and ready to go? I know it's not where you hoped to be Alehouse but it's going in the right direction at last. That's good then chicksta - but I wouldn't put ideas of a good time behind you yet! Yes I have my number, safety pins and fuel (I'm a Fruit Pastilles and dextrose tablets person....gels are not my friend). Post food and clothes are ready for hubby to hand me at the end. Clothes are sort of sorted. The forecast keeps changing. Going to start with a jacket and throw it to hubby on the way out of Preston Park so I start warm. He's currently making me pasta ☺ and has the map out working out where he and the boys will be. Haven't been this nervous since my Chemistry A-Level paper, and I managed to pass that! Daisy - it's just one foot in front of the other, relentless forward progress and you'll make the finish line. You got this girl! I know it sounds mad but smiling makes a big difference Daisy - there's even a good evidence base for it, when runners smile their perceived effort is less for the same pace, plus it makes other people smile too, win/win! I shall be thinking of you and willing you on. Thanks all ☺ I have indeed noticed smiling makes it feel easier. I'm the nutter who says hi to people when I'm out running. I find it makes the time pass more happily for me and takes my mind off it. I'm now stuffed full of pasta, all my stuff is sorted and calm has actually descended. And yes, remembered to fill the back of my race number out too! Going to watch crap TV and try and get an early night. Thanks again for the positive vibes! Oh no yet another setback LMH. You really could do with a break from it. Great tip regarding smiling for Daisy. Works for me. Seriously jealous of the cheese festival emzap. I would kill for some decent GB cheese. Great news regarding feeling good and parkrun Ale. Enjoy the new shoes WP and well done on your run PB. Snow Chicksta? 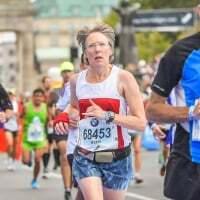 A bloke ran as the Brandenburger Tor in Berlin last year, I was just considering landmarks in Hamburg I probably won't ddo the 100 next year but the 56. No mountains this time but the race starts at 10pm which makes things interesting. Grr regarding the buggy Wabo. What: vigorous gardening, good cross training I hope. Hazel.....they pretty much eat anything and everything, but yes cakes, sweets and chocolate would beat the fruit bowl. I get through so many satsumas, apples and bread products here. Growing boys! It is official! I am a marathon runner! I did it in just over 5 hours. Had a very sticky bit around miles 21 to 23 when I thought I was going to vomit (too many jelly babies maybe) but the body held just walked it off and decided finishing better than pushing and bonking out. Shoreham Harbour is a God awful place! I did enjoy the experience and met some nice folk on the way. I have a cracking blood blister on my left big toe. The tape slipped and rubbed happily away. Just calling it a running trophy. Well done Daisy! Well toughed out on what was not a good day for running a marathon on the coast! Thank you. I stuck this completely on the wrong day lol! It was quite a head wind on the way back. And so, so cold at the end. Luckily my friend had a huge coat for me at the end as hubby was a way behind as he'd been at mile 23.